Manchester City are reportedly confident they’ve struck a deal to sign Riyad Mahrez from Leicester City for £65million in the upcoming transfer window. The Daily Star linked the Algeria international with Arsenal earlier this season, while the Daily Express recently added that a move to the Emirates Stadium would be his preferred option. Mahrez has been one of the finest players in the Premier League in recent times, playing a starring role for Leicester as they stunned world football to win the title in 2015/16. The 27-year-old’s form that year saw him crowned PFA Player of the Year, and he’s had another fine campaign this season that may finally have earned him a big move. After plenty of speculation over his future, it now looks like Mahrez will be on his way to City for £65m this summer, according to the Sun. 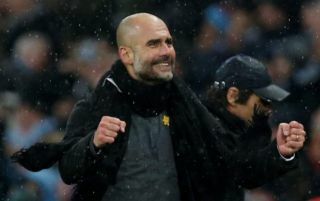 Their report states City believe they’ve got the move done, which looks an exciting potential addition to a side that has already dominated the Premier League this season and played some stunning attacking football. City broke all sorts of records on their way to winning the title and adding Mahrez to that front line will make them all the more fearsome next term and possibly more of a force in the Champions League.